Here are my costumes from the past few years. Some are a little embarrassing, some I'm very proud of. 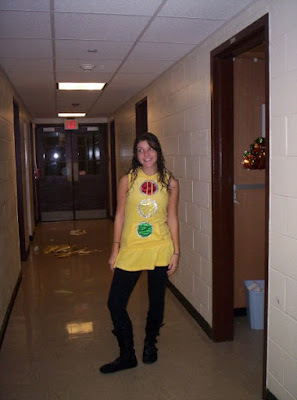 The most interesting thing is that I didn't really care much for Halloween in high school, and it wasn't until college that I started going all out in making costumes. There is something so freeing about going out in costume, you can release whatever you're feeling and feel very little self consciousness (but that will be elaborated on in my post-Halloween 2009 run down). 2006-This was the year that I was Lara Croft Tomb Raider (complete with Nerf gun that resided in a homemade cardboard holster on my leg) and a fairy but unfortunately there are no pictures of those. (I went to a different event every night that whole week before Halloween) Also, I was a 1940's pin-up girl with my roommate who looks exactly like Kate Beckinsale in Pearl Harbor in this picture. 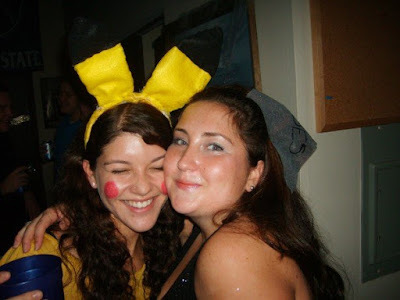 2007-Pikachu- this is the ONLY picture I have of that costume and that makes me so sad because I really had the whole Pikachu thing nailed on this one! 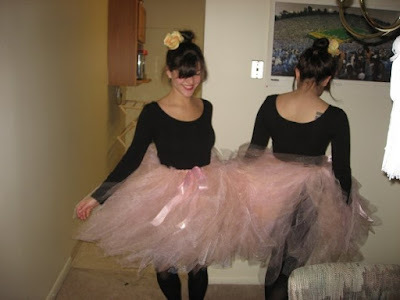 2008- Degas ballerina and my favorite Halloween costume of all time because I got to make a tutu. Oh wow- we don't do the whole halloween thing over here but you do look like you've had fun the last few years! I love the tutu and the pokemon character- very inventive! Do we get a hint of what you're going as this year? omg the degas costume is beautiful! you've got good halloween memories unlike me !! aw, I love the ballerina and the stop light ones! the degas balllerina costume is pure genius! I love the ballerina look. The flower in the hair is perfection. great costumes! 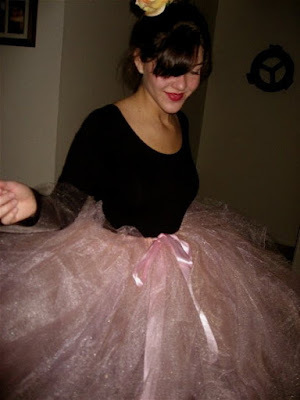 good job on this tutu! it's beautiful!